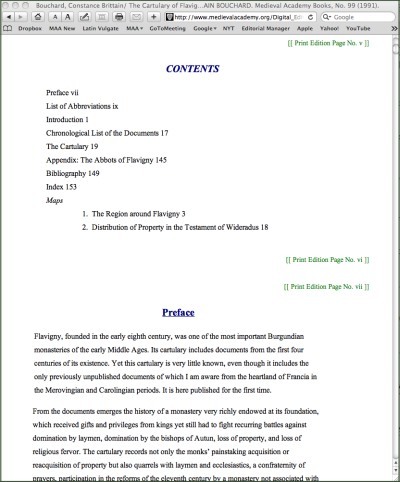 At the end of 2011 the Medieval Academy officially completed the terms of a grant from the National Endowment for the Humanities and published online thirty-eight electronic versions of previously published Medieval Academy books. XML versions of these titles are also available upon request. Jacqueline Brown and Paul E. Szarmach of the Medieval Academy were the project Co-Directors, while Patrick W. Conner of West Virginia University was Senior Consultant. Constance B. Bouchard (University of Akron), Siân Echard (University of British Columbia, Vancouver), David F. Johnson (Florida State University), Christopher Kleinhenz (University of Wisconsin, Madison), Deborah McGrady (University of Virginia), Patrick O’Neill (University of North Carolina, Chapel Hill), and Eckehard Simon (Harvard University) served on the project Advisory Board. Grapevine Publishing (http://www.grapevineps.com) provided technical services. Additional reviewers included James Gregory (University of Georgia), Justin Stover (Harvard University), Bridget Balint (Indiana University), Ann Marie Rasmussen (Duke University), and Lisa Fagin Davis (independent scholar).